Chess 3D simple worksheet for various chess analysis / puzzles. 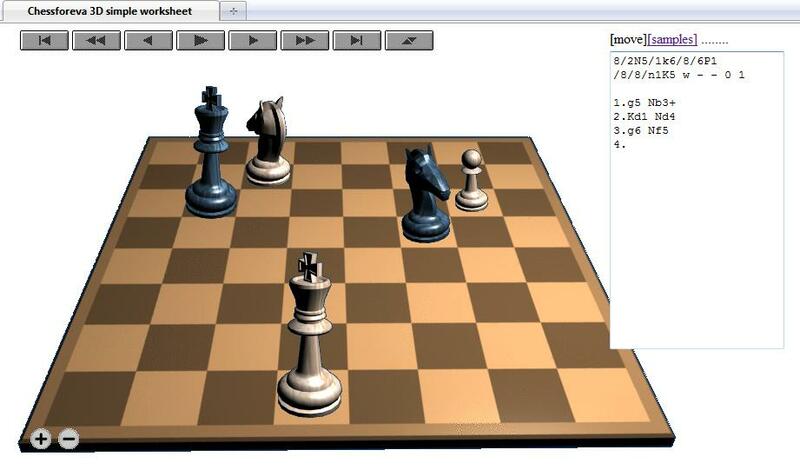 Write Your chess moves inline and get 3D chess board in browser. As result, You can get links like this. Use it in comments or blogs. Or express Your best move 3D way! Now also touch/mouse chess position setup, opening recording. Carl, this worksheet is good as link (to solution in a new browser's tab), or a tool for puzzle solving. If You'd like to embed then better use this sample or just a slider. BUT, I really suggest You to use 2D embeddings in blogs, because 3D takes too much space, is too heavy and there are lot better chess modules, as at chesstempo.com or dhtmlgoodies. 3D is good for fullscreen. Just my opinion. Usually You can embed every page as iframe. You should study topics at w3schools. Other level is object (java, flash) embedding. Blogger is cool because of html editing (when writing a post), where You put Your code. Read an article. Other platforms, as wordpress, disable much for security reasons. In fact, what You can really depends on blogging platform. I hope this helped. Ah, and just use source viewer tool of browser, when You see a good page. Page is the code. Simply try to use the same.